Go to Burger Plus for a fast and filling burger that’s very low priced. 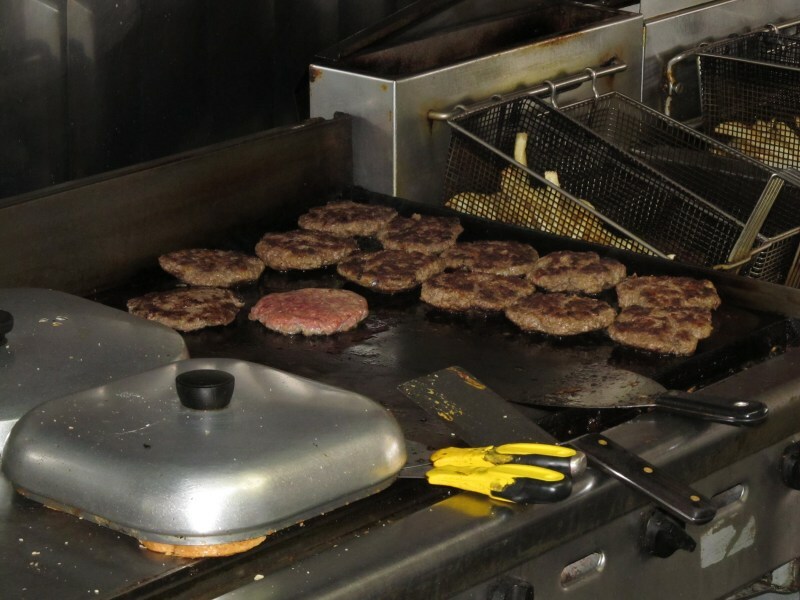 In fact, Burger Plus is our highest value burger at a counter service restaurant. A Fat Boy and drink cost $4. 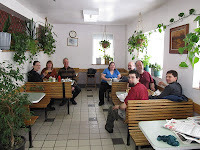 The restaurant is located at the corner of Sargent and Langside - hidden behind a little treed courtyard. In summer you can enjoy your burger outside at a picnic table. When we climbed up on the deck we were faced with two doors – the one on the right lead to burgers! It’s bright inside with wooden booths and a lot of ambitious plants. April noticed that Russ had a vine cradling his pate, and with leaves sticking out either side of his head, he bore a striking resemblance to Shrek. You order as you enter, and pay as you leave. When it came time to square up we didn’t need to tell the cook what we had – he remembered everyone’s orders. The cook’s all business. He took our orders rapid fire then turned to furiously prep burgers in the open kitchen. Don’t expect to distract him with idle chit-chat. His mom’s in charge of the drinks. She brought out cans one at a time and held them up until somebody put up their hand. 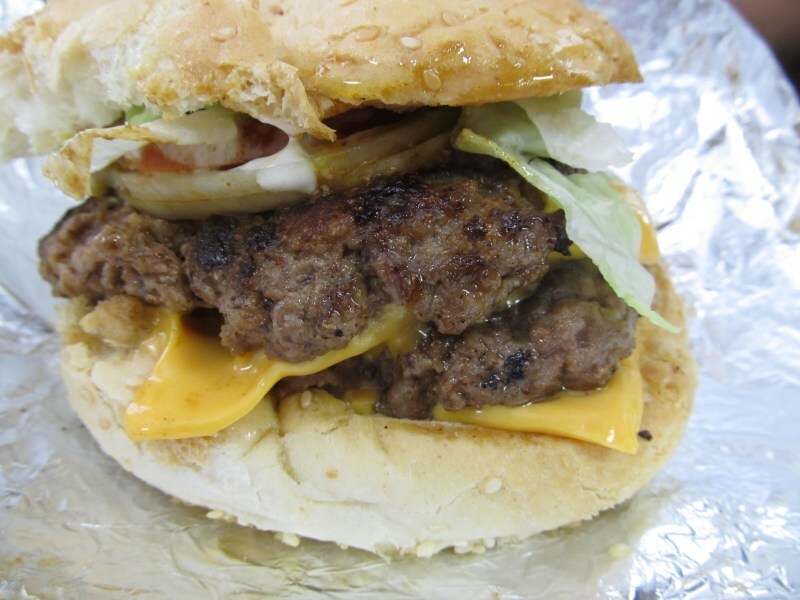 As the burgers finished cooking one by one, he loaded them with toppings and wrapped them in foil. If you were having fries as well, your burger came on a plate and tray. He emerged from the kitchen to deliver the burger than charged back to the grill. I only spotted one mistake – the bacon on Russ’s burger got forgotten but the cook realized as he was bringing it out. He ran back and brought out bacon for Russ to add to his burger. 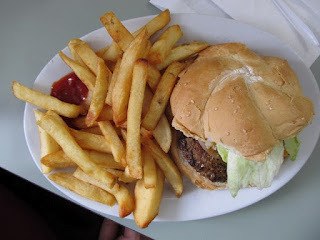 They were big hand formed patties on an even bigger bun and my double burger was very filling. The beef patties were moist, soft and served steaming hot. Karen thought the patty had a “unique seasoning, possibly cumin.” The fresh iceberg lettuce was very slippery and made even more so by the two nice big slices of juicy tomato. The bacon was crispy but it kept sliding away from me until all that was left was a bite of bun with two slices of bacon hanging off the back. There was some very mild chili sauce that pretty much went unnoticed. Cary commented that it “wasn’t the zingiest I have had.“ The raw onion was not overpowering, and contrary to usual burger assembly practices, the processed cheese was on the bottom. My burger mates challenged me on my comments last week that I could hardly ever taste the cheese. It seems I'm cheese impaired - I must have burnt that part of my tongue somewhere along the way. I'm no longer allowed to critique the cheese but I’m told the cheese at Burger Plus was good. 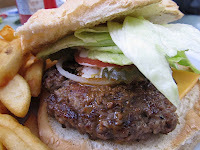 The bun was nice and soft - lightly toasted on the grill. Liz made sure to point out that her bun was small so not everybody had big buns! Liz commented that the “chocolate milkshake was good - you could tell it was real because it had a lot of lumps.” Her cheeseburger and milkshake cost $6. The milkshake alone at Blondies cost $12!! One correction. My Bacon wasn't just missing. I ordered a single Bacon cheeseburger and fries. I received a double fat boy with no Bacon.